Nitish Kumar has resigned as the Chief Minister of Bihar. Kumar submitted his resignation to Governor Keshari Nath Tripathi . The decision to quit was taken by Kumar at a meeting of JDU MLAs on Wednesday evening. Previously he served as the Chief Minister of Bihar from 2005 to 2014 and also served as a minister in the Union Government of India. He belongs to the Janata Dal (United) political party. He endeared himself to Biharis, used to low expectations from previous regimes, when as Chief Minister, his socialist policies bore dividends in appointing more than 100,000 school teachers, ensuring that doctors worked in primary health centers, electrification of villages, paving of roads, cutting female illiteracy by half, turning around a lawless state by cracking down on criminals and doubling the income of the average Bihari, The cumulative growth rate of GDP of Bihar during his tenure as CM is highest as compared to other states for that period. On 17 May 2014 he resigned, owning responsibility for his party’s poor performance in the 2014 general elections, and was succeeded by Jitan Ram Manjhi. However, he returned to office in February 2015 following political crisis in Bihar and won the state elections of November 2015. He was elected as the national president of his party on 10 April 2016. In the upcoming election of 2019 many politicians including Lalu Yadav, Tejaswi Yadav and others have proposed him for Prime minister post in India although he has denied such aspirations. He resigned again on July 26, 2017 as CM of Bihar over differences with the Coalition Partner RJD due to naming of Tejashwi Yadav, the deputy CM and Lalu’s Son in a FIR by the CBI. When I supported demonetisation and actions against benami property, how could I support benami property allegations against Tejashwi? I asked him to explain if there was a conspiracy to frame him. 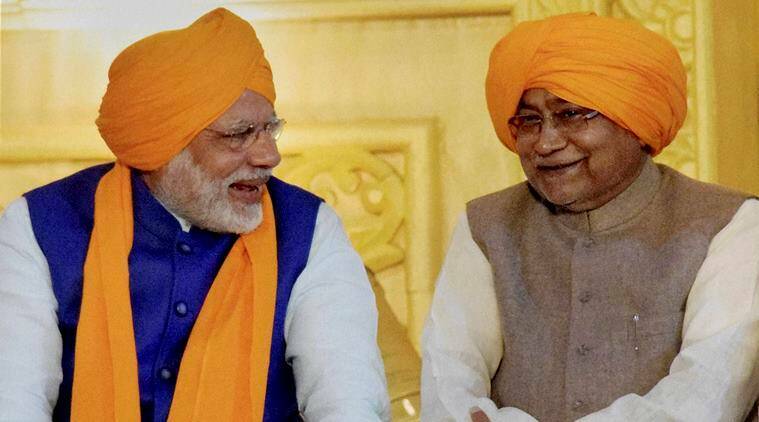 Since he and Lalu didn’t explain anything, I had no option but to step down said Nitish kumar. In a statement he also confirmed that he had talks with Lalu and tejashwi and just asked them to explain the scenario, as they refused it became impossible to work in the environment and it was against his conscience. Nitish Kumar’s government also initiated bicycle and meal programs – the government gave bicycles to girls who stayed in school – which saw Bihar getting huge number of girls into schools and fall in school drop out rates. In 2010, Nitish Kumar’s party swept back to power along with its allies (at that time), Bharatiya Janata Party. On 26 November 2010, Nitish Kumar took oath as a Chief Minister of Bihar. This was his second consecutive term as Chief Minister of Bihar.In a keenly fought contest, Nitish Kumar led JDU-BJP to combine won with four-fifth majority. NDA won 206 seats while RJD won 22 seats. No party there has won enough seats to represent the opposition in the state assembly, which requires at least 25 seats to become eligible to represent the main opposition party. For the first time, electorates witnessed high turnout of women and young voters, while this was declared as the fairest election in Bihar, with no bloodshed or poll violence. Nitish Kumar again assumed office of the Chief Minister on 22 February 2015, on the backdrop of upcoming 2015 Bihar Legislative Assembly election, considered to be his toughest election till date.Thus, Nitish Kumar’s JD(U) along with RJD and Congress, formed the Mahagathbandhan (Grand Alliance) to counter the BJP in Bihar. Nitish campaigned aggressively during the elections for the Grand Alliance, countering the allegations raised by Narendra Modi and the BJP. Finally, the Grand Alliance won the Assembly election by a huge margin of 178 seats against 58 seats of the BJP and its allies, and RJD emerged as the largest party by winning 80 seats and JD(U) came second, winning 71 seats.He was sworn in as Chief Minister on 20 November 2015 for a record fifth time and Lalu Yadav’s youngest son Tejashwi Yadav became the fourth Deputy Chief Minister of Bihar. But on July 26 2017 he resigned as Chief Minister of Bihar. Be the first to comment on "Nitish Kumar, No Longer The Savior of Bihar, Submits his Resignation"